After being married for twelve years, my husband and I have many ideas and dreams that we think are our own but have actually been adopted from the other. Many dreams we once had have died and been long forgotten. We have spent a greater part of 2009 trying to breathe life into the dead dreams, prioritize our goals and organize a plan to realize some of those old dreams...and maybe even a few new ones along the way! Embarking on this journey of dreams has been a rather wild ride. There are days we are both so enthusiastic it's obnoxious to outsiders who are not privvy to our innermost desires. There are days when it's super hard to keep on going. I have noticed that when I stumble along the path he is always there to pull me up alongside him with a strong and reassuring hand. Other days I have felt myself pushing him from behind to make a steep path traversible. I love how when one is down the other is up and vice versa. I am so blessed to be traveling on the narrow path with him. I am so grateful to know the One who goes before us is making the journey worthwhile and the destination possible. Thursday I traveled to the D6 conference in Dallas where I had the good pleasure of meeting some bloggy buddies. Lindsey, Vern and Leah were there. Yaay! Sadly I missed Renee, who was in her room resting. Please add your prayers for the Swope family as they prepare to travel to Ethiopia to meet their baby girl, Aster. Please pray for health, rest and peace for them in the midst of life and ministry. Lindsey and I had a long dinner with a million discussions all wrapped up in a spicy chicken salad from Pei Wei. Meeting someone you've known for awhile from reading their blog and even a long chat by phone is exciting, fun and strange all squished together. I felt immediately comfortable with Lindsey but every once in awhile I'd glance over at her and be reminded that I know her but I don't. Get it? My favorite thing about knowing Lindsey in real life is her dimples. I'm taking that smile with me and continuing to praise God for friends who meet my heart before my flesh. Gotta love the blog ya'll!! Remember the old saying, "One man's trash is another man's treasure?" In reading Nehemiah I was reminded that God sees value and passes value to us but it can remain unseen by others. As the Jews rebuilt Jerusalem's wall, they knew God had called them. They knew it was important. They knew that if they didn't do it, God's purpose wouldn't be fulfilled. They are, after all, God's chosen people. As they built, the naysayers started talking. Mocking them in their "feeble" efforts. The job, which was a big one, a huge, gigantic one, looked impossible. Are you facing an impossible challenge in your life? Are you trying to accomplish the big picture. Don't settle. Take some advice from Nehemiah. He called those on his team to stand guard as others worked. He knew Who was the captain of his team. Even if what you're building your dream with is in ruins, rubble of what once was, keep stacking. One small stone at a time. Eventually the voices will be silent. Because one day they'll see a wall. As the Jews worked, this is what they heard, "Do they actually think they can make something of stones from a rubbish heap—and charred ones at that?" As the taunts and jeers poured forth, they had a choice to make. What would they see and what would they believe? Choose to see the beautiful, protective stone wall not the crushed, broken stones. Today is your day and all you do is take care of me. You don't go unappreciated or unloved. I remember the first year we were married. Your birthday was a happy day. I wanted to celebrate you in such a big way. Honestly, I never was so happy another human was born than I was that you were that day. Until today. I'm happier now than I was then that you were born. For me. I love growing old with you, honey! Let's keep drinking from the fountain of youth!! So often I lament what I'm going through. You know what I mean. They why me's and the oh no's so often invade our minds and we begin to doubt. Do you believe in God's sovereignty? I mean really believe? Webster's defines sovereign as being above all others in character, importance, excellence. If we believe God knows best then why do we doubt the happenings in our life? If only I'd done this instead of that or this happened last year or if only I'd known the what I know now. You get the picture. I've been pondering timing lately. I do believe that my life to this point has prepared me to deal with my life at this point. Does that make sense? The opportunities I have today were meant solely for today because yesterday I was not yet ready to take advantage of them. That's how God planned it. As I read and pondered the story of Esther, I wondered if she recognized God's sovereignty in her own life. Mordecai did and he was able to encourage her to walk in her purpose because God had prepared her and called her. She even says she will approach the king and if she dies, she dies. Maybe we all face some resignation in receiving the gift of timing. I'm going for it but if I lose, I lose. Recognize the right opportunity for today. I've been having some moments where my faith is being assaulted. Now my foundational beliefs are solid but the part of the that looks for the things to come is definitely under attack! Hebrews 11:1 tells me, "Faith is the confidence that what we hope for will actually happen." So I guess what I'm saying is I've been living a little unsure lately. My confidence is lacking. One of the primary things that gets me successfully through each day is being sure of what will come. On days like this, my main quest becomes receiving new confidence and becoming sure once again. As I lamented to the Lord earlier, I began looking at where I'd stepped off the narrow road. I've been asking for a fresh revelation to strengthen my steps and lengthen my stride. As I was driving along planning my day in my head, the manna came. Instantly I knew its meaning. I needed to linger at the well. Living water will wash my soul and clear my vision. John 7:38 says, "Rivers of living water will brim and spill out of the depths of anyone who believes in me." Does that sound like joyful confidence or what? I just needed a good washing with the word. Time to ponder, experience and recharge. Time in the presence of Living Water. So that in the future I will surely say, "what we now see did not come from anything that can be seen." Friday night I had the distinct pleasure of reuniting with some very special ladies. I got together with some ladies from Reinhardt Bible Church. That's the church I went to until I was in ninth grade. I moved that next summer and lost touch with many wonderful friends. Friends I had known since preschool days. Friends I had gone to school with since kindergarten. Friends I saw every week and some every day. Friends I shared a bunk with at camp every summer from first to ninth grade. Friends who rode that clunky old bus with me all the way to Detroit, Texas and Dale Hollow, Tennessee. The best kind of friends. Friends who were with me celebrating the day I asked Jesus into my heart. Friends who watched my childlike faith take deep roots. Friends who sang silly camp songs and put on church plays. It was a happy night. I was so jazzed that driving the three-and-a-half hour drive back home didn't seem so long. I shed a few tears just thanking God for Facebook. These were friends I never meant to lose touch with, ever. It's just that one can only talk on the phone so much...twenty-five years ago, there was no email, texting or Facebook. There was no way to keep up with everyone. You can't even pass notes if you never see each other. So, some I got to go to their weddings because our parents still knew where we were. Others I sort of knew where they were but hadn't visited with the in awhile, a long while. Most of these ladies hadn't been hugged by me in twenty-five years! It was one amazing night! The winner of Karen Chaffin's book, Heavenly Minded for Earthly Good is cpullum. Congratulations!! Thanks to all of you for stopping by Glad Chatter. It was so much fun doing my first giveaway that I think I'll have another really soon! There hasn't been much buzz here about my running lately. Lest you think I'm not, I'll give you the latest. I've been running steadily since May. I'm confident that I'll be able to complete my first half marathon and my first marathon by November 2010. There have been so many blessings from this time with the Lord. Because that's just what it has been. Time with the Lord because when I run the world and all its noise fades away and we're alone. Together. When I first started running I had several goals in mind. I wanted to very shallowly look better, lose weight and get in better shape. God had really convicted me that I pray to live a long life but did not have a healthy lifestyle. The main goal however, was to do something big before my fortieth birthday. To prove to myself that there will still be enough time to make a mark on humanity after forty. I heard God whisper to my heart, "If you do this, I will change you." The change has only just begun. I couldn't be more thrilled. I've run up to eight miles and it's still hard. Every day it's hard. Every day it's oh so very worth it! I've lost the weight I set out to lose. I've gained enough confidence to know I'll finish that marathon before I turn forty. I've received many blessings from accepting this invitation from the Lord. The greatest one has been hearing him speak. When I'm running, I hear him. And, nothing can top that. Hearing his voice keeps me going. Harder. Faster. Farther. It's written on some notecards I like to use. It strikes a chord in my soul. Although at times I find it hard to believe my life will be full of great things, my life has definitely been full of small beginnings. Small gives me confident belief that great is coming. When we experience God doing something small for us, we begin to see how great is truly possible in our own lives. There was a time in the not so distant past that I really didn't even believe my life was worthy of small. Today I see small as a great beginning. Small is definitely the beginning of greatness. I'm learning that unbelief can be my dream's biggest enemy. Whether it's the unbelief I feel that chokes the life out of my own small beginnings or the unbelief of those around me who voice their doubts of the greatness to come, unbelief leads to discouragement. Discouragement leads to disappointment. Undisciplined disappointment can cause stumbling or even stopping. Unbelief whispers that I should be satisfied with the small. I'm grateful, yes but satisfied, no. Unbelief offers small beginnings as a finished product. Unbelief lies to the soul, "Small is as great as it gets." Belief motivates the heart, "Better things are yet to come. Never settle for the small." Belief uses small as a stepping stone to the great. Small beginnings are foundational stones put in place to build our belief. God is rejoicing in each small beginning. Let us rejoice with Him! I've been listening to some motivational speaking on CD. I recently fell in love with Myles Munroe. Reaching one's full potential is something we talk of, dream of and reach for regularly. Actually doing it, now that's another story. A cliche even, some would say. Because in order to reach our full potential we must never become satisfied with our most current accomplishment less we become complacent and stop developing. Potential comes form the root word meaning power. To be full of power is to be full of potential. Potential is hidden power, unleashed creativity and unused talent. To recognize my own power strengthens me. Becoming who I was meant to be is realizing potential. The question becomes, "Who was I created to be?" In order to answer it, I must spend time with the One who created me because I want the answer. I want potential realized in my life. I want creativity unleashed, talent used up and power on display for the world to see. As I live a life recognizing my own power to make a mark on humanity, which comes from the power of Christ within me, I pour out my gifts, my talent, my words, my actions, my service on my fellow man. I long to live a life poured out, a life well spent not saved. A life wasted on worshipping Jesus not just wasted. Potential used up for his purpose with nothing left to realize. I long to be one who finishes well. I want to die empty. In honor of the fourth birthday of Glad Chatter, I am hosting my very first, and very long overdue, giveaway!!! On Mondays and Thursdays, author, speaker and my friend, Karen Chaffin, is hosting a Bible study on her facebook page. Heavenly Minded for Earthly Good is a wonderful way to set your sights high and accomplish more good on here than you ever dreamed you could. Just leave a comment with your name and email and I will announce a winner on Monday. Meanwhile, hop over to facebook and listen in on the discussion about heaven. I love THAT word! Blog, blog, blog. I have a blog. Doesn't that sound cool? All of my really cool friends have one. By really cool, I mean younger. I can remember when there was no such word as blog. Blog was a nonsense word, a word you could only find in a Dr. Seuss book. Now, it's a real word, a real activity, a real thing. My maternal grandfather, a master storyteller, loves humor. It comes across in every conversation, each letter, constant joking...He never forgets the punchline! My grandmother, an autobiographical poet, truly, writing of her deepest experiences in rhythm, rhyme and prose. My mother has every paper, speech and thought she has ever recorded organized and filed away...Where she can find it! My father can hold an audience captive with his lively, descriptive, creative and entertaining language! My aunts, uncles and cousins are masters; they write, preach, sing and any other craft involving words. Because I love words so much, one might say they are God's gift to me. 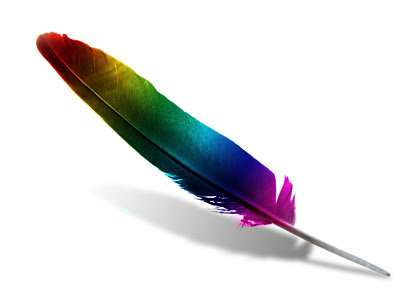 I have felt the tug of God on my heart to write. But because of what I do all day, as Stasi Eldredge,author of Captivating, said in a recent magazine article, I am in a season of "wiping" noses, bottoms, cabinets, floors, you name it, I wipe it hourly on a daily basis. I can easily be too busy in the day to day living of life to pursue the gifts that make me who I am. Last week I decided I needed to "practice" writing, God's gift to me...blogging. After deciding to probably, hopefully, sometime to start a blog, Sunday's sermon was on vision. The pastor gave an analogy of a farmer who planted his crops then got up day after day to sit on his porch and pray that God would give him a great harvest without doing any more work. Although it is God who ultimately sends sun, wind and rain necessary to produce a crop, the farmer is responsible for far more than only planting seed. This blog is an attempt to keep on working the fields of my gifting, so to speak. Instead of letting these words roll around in my head and in my heart without ever actually being heard...I blog. I don't want to be like the servant in Matthew 25 who had his talent(money) taken away by his master because he was afraid to invest it. I want a return on what God has given me! I can now see that when the season of wiping is over, I may or may not remember who I am without wiping. I want to remember who I am and know who I am becoming. I am a person, called by God to use my gifts to bring glory to His name. I want to be found worthy of this calling I have received. ..."I want you to get out there and walk--better yet, run!--on the road God called you to travel. I don't want any of you sitting on your hands..."
So, here's to happy writing...I mean, blogging! Rein: to curb; restrain; control. Reign: to have control, rule, or influence of any kind. My life is a constant juggling act. As a wife, mother of four young children, real estate broker, business builder, Bible study leader, aspiring writer and speaker, I am Barnum's funniest clown; I have way to many plates in the air to be successful in this circus of life. 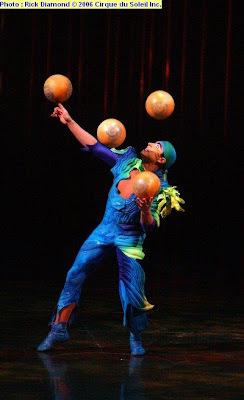 Once the additional plates of laundry, grocery shopping, cooking, cleaning, carpool and homework are thrown into the mix, I quickly begin to resemble a Cirque du Soleil trainee trying to keep them all spinning. Let's face it, with so much at stake, there are many days I chip a plate or two or worse. Times where they all come crashing to the ground in a million broken pieces leaving casualties along the way. Some grace-filled days, miraculously, the plates spin, the juggling continues and all is well. A phrase that keeps coming up in my current business coaching is, "Learn to discipline your disappointments." In my head I think of reining them in like wild horses breaking toward the barn. That's how emotional I really am. Disappointments come at me as my plates crash to the ground and before I can pick them up and start my juggling routine again, I must stare at the mess, shed a few tears and deliberate on the best method of cleaning...all before I actually pick them up and start again. Like wild horses toward the barn, my emotions run hot and heavy propelling me in one direction. And that direction is not forward. Because the disappointments do come and they will come. They descent quickly upon me to remind me that juggling is not what I'm best at. It's simply what I must do. Whether it's a forgotten appointment, dissatisfied client or hurt friend, plates fall. Plates break. Juggling ceases. I'm trying to make the times of ceasing much, much less than the time spent practicing the juggle. Practicing juggling will make me better. This week I'm learning from the casualties, quickly cleaning up the mess and juggling as hard and fast as I can. I'm getting better. I see little victories already. Humbling myself, examining casualties and moving forward. Learning to clean the shards of responsibility without slashing myself on shattered expectations. What I've discovered this week is that by reining my disappointments, I am actually reigning my disappointments. And, that makes juggling worth it! Andrew has come through surgery and cognitively seems fine! He has regained some strength in his left side and we are praising God and waiting for the rest of his strength to return. Things are looking up but many prayers are still needed. Thanks to everyone to rallied around the throne of God on behalf of this precious boy and his family. I will get around to visit with each of you to meet personally. I have loved seeing God's heart beating in His people! Seeing the goodness of God in the land of the living! 8:00 P.M. EST Urgent! Please Pray! It's me, Melanie (Bella~Mella). The surgeon just spoke to us and Andrew came through surgery. He removed most of the tumor. Dr. Pincus said when Andrew wakes up, we will know if there is any damage...loss of cognitive ability, paralysis, etc. WE ARE BELIEVING FOR THE MIRACLE TO BE 100%. KEEP BELIEVING WITH US!!! AS ALWAYS, WE ARE GOING WITH GOD ON THIS. ANOTHER HOUR AND WE WILL SEE THE GOODNESS OF THE LORD IN THE LAND OF THE LIVING. THANK YOU SISTERS FOR YOUR INTERCESSION, FOR NOT GIVING UP, FOR WAKING IN THE NIGHT TO PRAY, FOR ENCOURAGING ME. Melanie, over at Bella Mella, just called. Her son, Andrew, who is battling brain cancer just went into surgery to save his life. They have had a very difficult three days and the Lord led them to Shand's Hospital in Gainesville, Florida this morning. Dr. Pincus is performing the surgery and they will be in the operating room for about the next four hours. 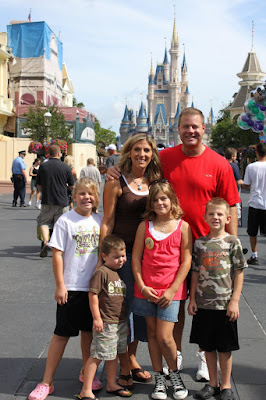 The Dorsey's were told the surgery was inoperable yet God has led them to surgery. Please pray for our good and mighty God to perform a huge miracle in Andrew's life. I will keep everyone updated as I hear more. Melanie thanks everyone for storming the gates of heaven on her boy's behalf. God makes all things new. God makes all things beautiful in his time...Even my blog! Don't y'all just love Glad Chatter's new look?!?! We're still a little under construction and I will be working, probably slowly, to get pages and words to all the links, new posts up for your enjoyment and the rest of those long-promised pictures. Stay tuned for my first giveaway coming very, very soon!! Very soon!! I promise!! For today, pop in on Edie and give her a shout of thanks for fixin' me up leopard-style. And, then leave me a comment, especially if I haven't visited in awhile. I'm trying to round up all my friends so I can have your links all together and start my bloggy visits once again because I've missed you all so much this summer. Remember that last dance with summer, I talked about a couple of weeks ago? As promised, here are pictures. 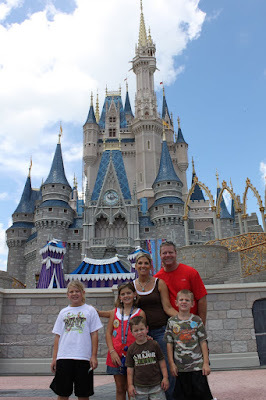 As you view them, remember that Andrew and I are just crazy enough to travel cross country, with all four children to Orlando. We decided Sunday night about midnight we would go. Tuesday we packed the car and left for a trip of a lifetime. Can you believe we visited all these incredible places on a spur-of-the-moment-pack-your-bags-jump-in-the-car trip? 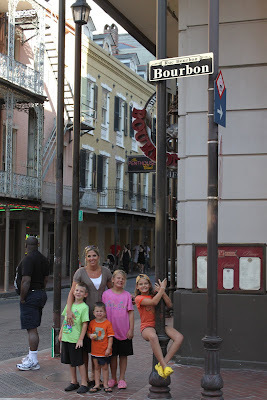 I know, I know, all my hyper-planner friends are cringing but trust me, it was a perfect trip. 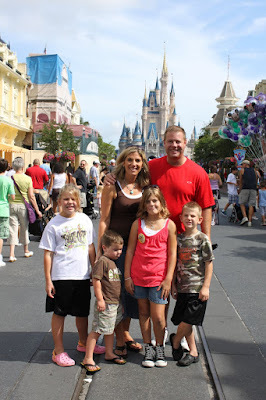 Our visit to Magic Kingdom was magical. And, yes, we surely have a huge why for doing something like that. But you'll have to wait to hear the rest of the story until another day. For today, enjoy the view! Adding to my list of friends that I have hugged in real life is one of my favorite things to do! Who knew that in the year 2009, I would travel to so many new places and meet face-to-face so many friends from this wonderful bloggy community? Well, I know Who knew. On my flirty little spontaneous say farewell to summer getaway, I got to meet a new friend. Lisa is just one of those ladies who makes you a better person for knowing. Every single comment she leaves on my blog makes me want to pray, intercede in a mighty way. Visiting with her in person was like that too. I left feeling stronger, encouraged and grateful. Meeting her in person (and her gorgeous daughter) was a privilege and a blessing. She took time from her busy weekend to drive across Orlando to visit with me. And, as if meeting her wasn't enough, she brought me gifts. This lady gave me not one, but two, Bibles!!! What better gift than that? Really, meeting her was one great blessing! She encourages women to find their purpose and daily live it. She is so others' focused that she just oozes sweetness and compassion. She also oozes Jesus and his mighty power. If you don't know her, take a minute to stop by her place and visit. Here lately I'm looking to align myself with people who have vision. If you have a dream, let's talk. I've had a dream for many, many years. A dream I've spent many years afraid to voice. A dream I tried to secretly pursue because I did not have enough faith in the One who gives dreams to fulfill it. I'm reading an awesome little book called The Dream Giver. A few days ago I read a chapter I just can't get past. I've reread it every day since. It's about the wasteland. I wept every.single.time. I read it. I feel the need to unburden myself of some of the feelings I felt in the wasteland of my life. I am no longer living in the wasteland but have mourned the loss of time openly for quite some time here at Glad Chatter. So, let the unburdening begin...here goes. I spent years, like an entire decade, living in a wasteland. Wasting. Years. Waiting. For something. Anything. To happen. As my dream was wasting away here, in the dry, desolate, wasted space, my vision faded. Faded so much I almost lost it. I almost forgot my dream all together. This place sucked so much light out of my dream, it became a dim shadow I was straining to see instead of a bright beacon drawing me forward. Until one day my eyes became so tired of straining in the night, I almost stopped looking. Just as I was looking down, God came and lifted my head once more. And when we trust in what, or rather Who, we do not see we are exercising...faith. So it was that during the long, dark night that I met faith and became much stronger for the journey ahead. What a joy that journey has been! As promised, tonight I'm revealing this powerful and life-changing book I am reading. 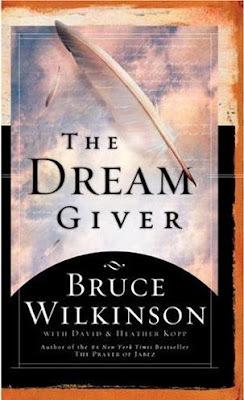 It is called The Dream Giver by Bruce Wilkinson. Awhile back, okay years, the Lord told me to read the book. It was so long ago I don't even remember where I heard about it. But once I heard about it, I heard again and again and again. Barbara over at B's talked about it changing her life, my sister-in-law urged me to listen to it on CD and it came up on many a reading list in business seminars and professional and personal development conferences. When I attended a conference last weekend, one of the challenges was to read fifteen minutes daily. Now, I gave up reading anything other than the Bible until I could be consistent about reading my Bible each day several years ago. Once I started reading my Bible daily, I figured I didn't have time to read much...er, at all. I contemplated the challenge and decided that reading my Bible qualified me for the challenge since I spend at least that much time in it. But then. I was waltzing past the book table trying not to look because number one, I love books and number two, I don't have time to read. Right? When the book caught my eye. They had one copy of the one little book God had been calling me to read. Destiny? I think so! I have dreams. Big dreams. At least I had big dreams...When I was a small girl. I remember the pig-tailed school girl with missing front teeth who thought being on radio and talking to big audiences would be a blast. I remember lining up my stuffed animals from largest to smallest in rows across the top of my bed and speaking from scribbled notes all the elementary wisdom I thought they should hear. I remember filling up hundreds of spirals with squiggly lines, lining them up on a bookshelf and sitting down and signing my name on the first page of them all. That was my first book signing. And, to date, my only. But that will no longer be a discouragement to me. It will become fuel to urge me to fully engage in what I was always meant to do. Speak. Write. Share. Teach. Think. Listen. Relate. Over the past two years I have intentionally walked towards this personal goal step by small step. This year I spoke at some ladies events. I loved it! Honestly, teaching other ladies, sharing my heart, my journey, my mistakes, my triumphs is a great privilege that I will never take lightly and will give thanks for forever. I"ve been speaking to the tens. Fifty here and fifteen there. When asked how I felt about the speaking engagements, my response was, "it is an awesome start." And I meant that. A great start to seeing a big dream. Someone told me that God may not call me to speak to the hundreds. He may only call me to the tens. I agreed with an "Ummhmm." But the truth is when I close my eyes, I see hundreds and even thousands coming to hear what the Lord will say to their hearts and coming to see what the Lord will do in their hearts. I see lots. I want to write lots. I dream big. One of my favorite sayings is, "From small beginnings come great things." The theme of my life is one that begins small and then grows. Larger. I've seen this theme played out over the years. I believe that the pattern will repeat itself. I have faith that the Dream Giver would not have put a big dream in my heart to dwell as a dim shadow. The Dream Giver I am intimately acquainted with gives dreams, all dreams, to beat brightly in our hearts as our faith grows. Now, you might ask how do I know this dream is from the Dream Giver? The Bible is clear that there are certain disciplines we are to practice to live fully in God's will. We must spend time in Bible study, pray, fellowship with other believers, serve others, help the needy, share the gospel, practice hospitality and quite a few others. Beyond that, I believe that my personal relationship with a living and speaking God connects me to His throne. Prayer being the lifeline that takes me there. Faith giving me the courage to hear his voice. The Word of God being the standard for which everything I hear is judged and measured. Remember the "given much" theory? Much blessing given, much responsibility required. Here is the beginning of that.